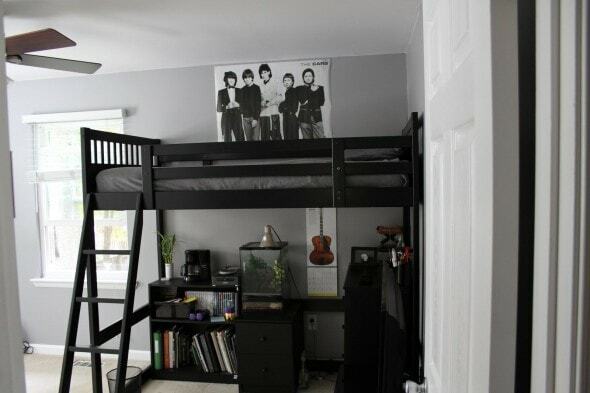 For those of you just tuning in…my big summer project this year was Joshua’s room. He and I painted his walls, his trim, and a loft bed we bought off of Craig’s list. 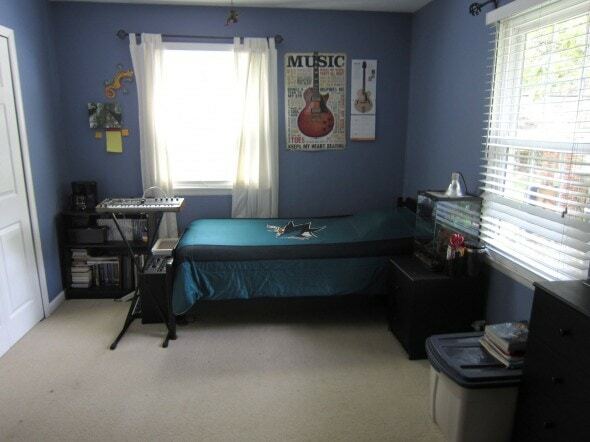 And we decluttered and reorganized his room in the process. First up, some before pictures, because they make after pictures just that much better. 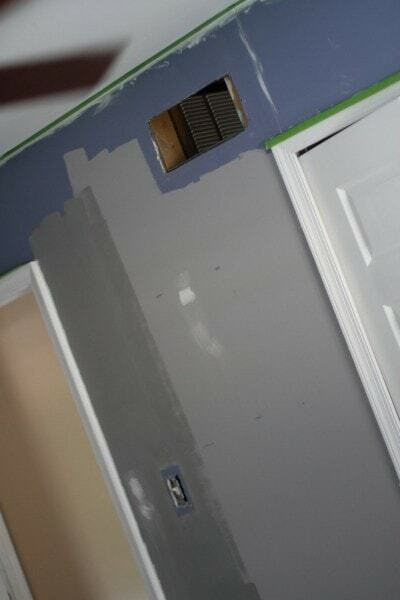 His room wasn’t really in terrible shape before we tackled this project, but there was some damage to the walls (old wall paper glue seeping in, holes, scrapes, etc.) and the moldings were really beat up. 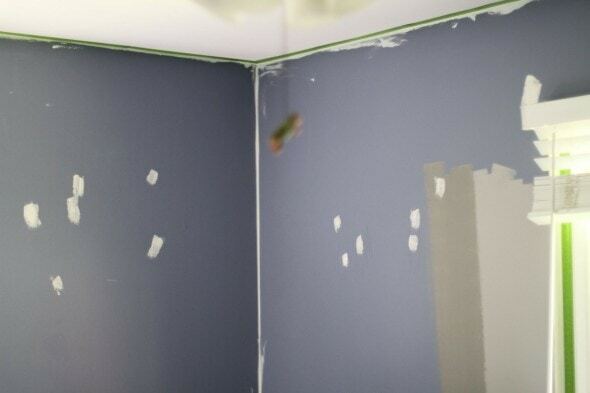 We had to do a lot of prep work before painting…we spackled holes from old wall hangings and the old curtain rods, we painted the ceiling and moldings, and I used caulk to make the drywall seems less jagged (it’s pretty old and imperfect drywall). 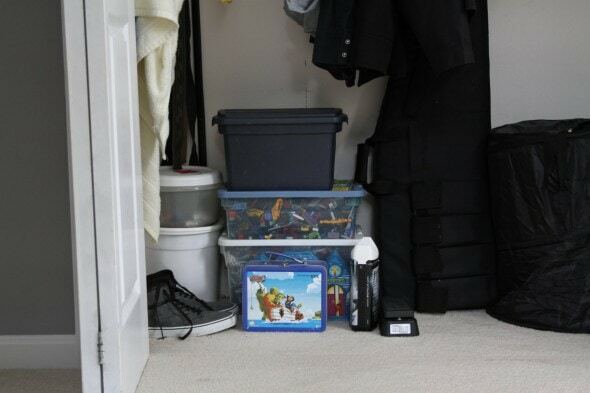 Another problem in Joshua’s room is that the storage was a little not-cohesive. And we knew we wanted to get rid of the enormous 1000-pound TV in the corner. The main reason we took this on, though, was to get the loft bed into the room and to free up some space for a future drum set purchase. This room used to belong to Mr. FG and me. 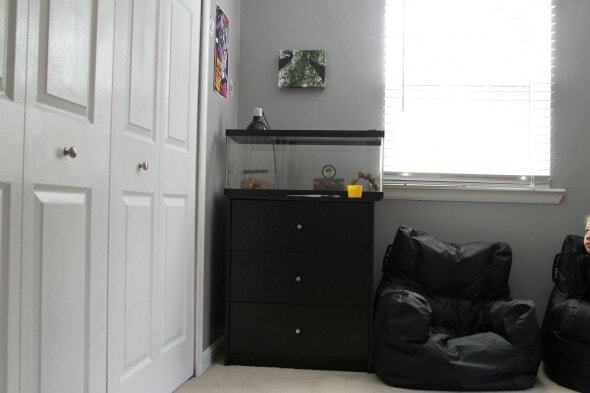 But then Zoe came along, so we made an extra bedroom, and this one became Joshua’s. However, the paint color is still the original one I picked back in 2005, so he was pretty thrilled to be able to pick a color of his own choosing. Joshua’s pretty into the monochromatic thing these days, so he chose a shade of gray. Which was more than fine with me because I dig neutrals pretty hard. The paint is Behr Sparrow. We initially got a sample of this and a darker shade, and Joshua decided the lighter paint would look better. I happen to love it too, which is great. Joshua’s craigslist bed is solid wood (originally from Ikea), and it used to be sort of a walnut color. It wasn’t super ugly, but Joshua definitely wanted it to be black. So we made it black. 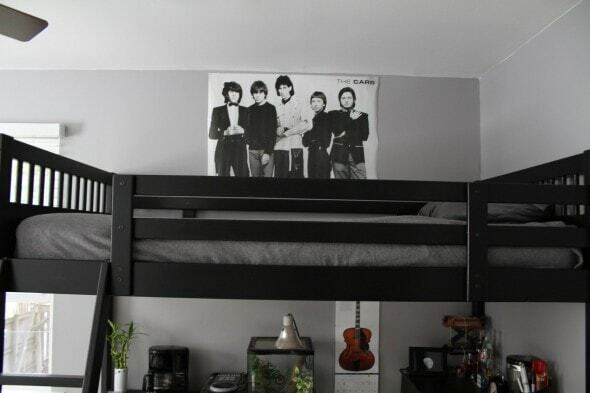 It was a pretty big job because of all the pieces a loft bed has, but Joshua and I worked together and got it done. His mattress fits pretty tightly into the loft bed, so instead of a comforter, I bought him a warm blanket (in monochromatic gray, of course) and we’ll see how that works out. Most of Joshua’s furniture fit under the loft, which is exactly what we were hoping for. He does currently have one dresser in this corner. 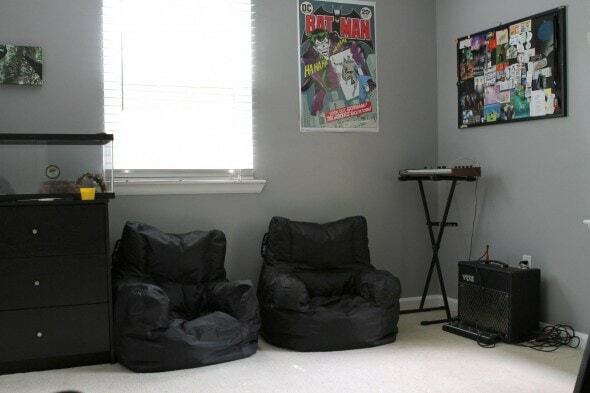 He’s saving up for a drum set purchase, and when that happens, the dresser will go at the foot of his bed, the beanbag chairs will scoot over, and this corner will house the drums. To maximize space, we opted to freecycle the behemoth TV and buy a flat-screen in its place. Mr. FG took care of all the research (because for me, researching TVs is right up there with sticking forks in my eyeballs!) and we ended up buying this at Costco. 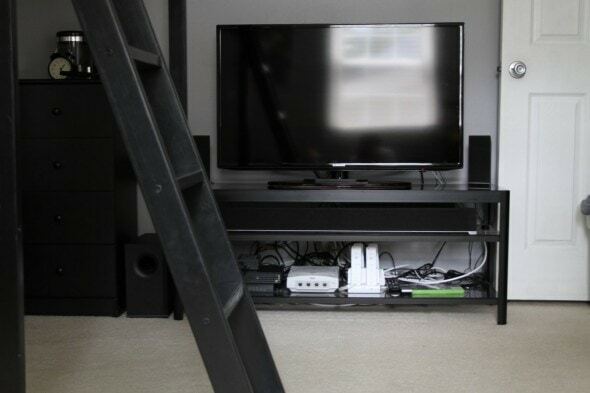 The glass and metal TV stand is from Ikea. It’s pretty sturdy and heavy duty, and I’m optimistic about how long it will last. It fits EXACTLY between the bed and the open door…if it was even one inch bigger, it would be a no-go. Joshua decided he would like to go without any window treatments (yay for simplicity! ), so we just kept the faux wood blinds that we put in when we bought the house. We’ve gotten all of ours at Home Depot, and have been very happy with them. 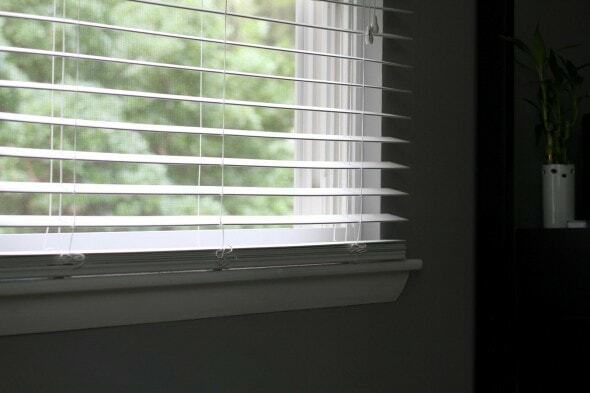 They cost a fraction of what wood blinds do and they look really great. And they are far more durable than mini-blinds. I accidentally broke one of Joshua’s frames during this whole process, so I bought him a new one at Ikea, along with this shiny clock. The photos are his own work (you can see more on his blog!) and are both point and shoot photos. I know I’m his mom and all, but he really does take some awfully good photos with a $100 camera. Because Joshua’s room is the largest, we’ve always stored some toys in his closet. When we put his room back together, we sorted through the toys, gave away ones that no one really loves anymore, and kept only the ones that are really timeless. 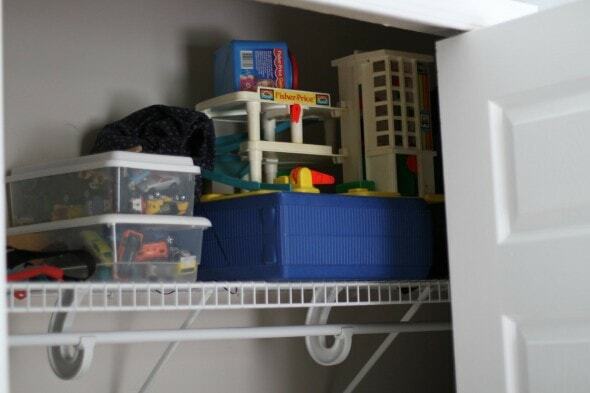 The pared-down collection now fits on the top shelf in his closet, leaving the bottom area free for his stuff. Joshua decided to sell his Bionicle collection, so once we list and sell those, his closet will be even more spacious. I’m so, so glad we managed to get this all done before school started! It’s been kind of weighing on me since we bought the loft bed last fall, so I feel all kinds of fabulous about crossing this off of my to-do list. I did Lisey’s room last summer, and Joshua’s room this summer, so Sonia and Zoe feel somewhat strongly that they are in line for next summer. 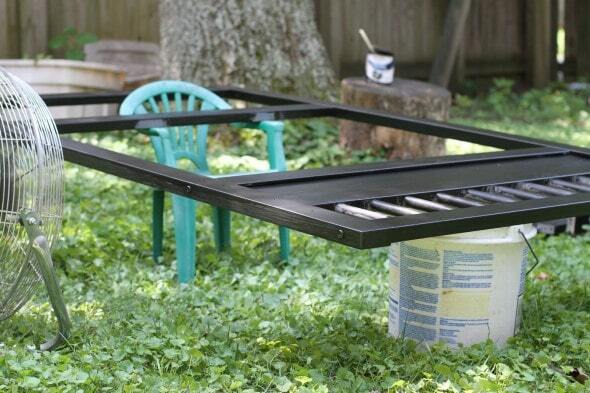 I’m not sure I’m up for the task of painting their bunkbed (so. many. pieces. ), but they may talk me into doing their walls at least. But for now, I’m happy to take a break from painting. « I’ve never met a kid who didn’t like baking. Wow, that looks awesome! 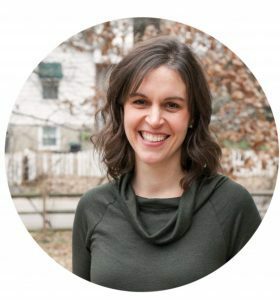 Congrats on finishing your project! I’ve never tackled painting anything (walls, my nails, the town red…) so this is super amazing to me. You did a fantatic job the two of you. It turned out so nice. 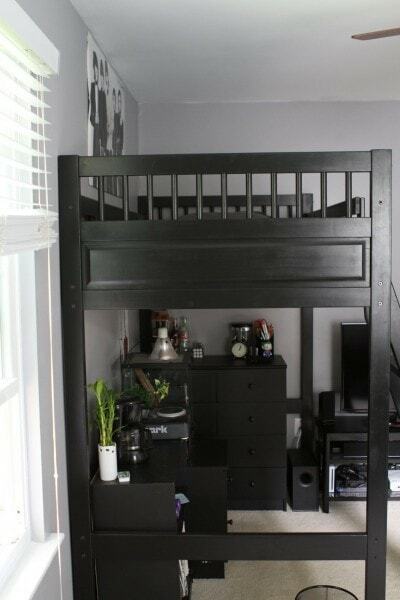 I love the bink bed in black. Great job. While I am deeply impressed by him having a Dreamcast, part of me wonders why there is no NES. Heh-of course THAT is what you noticed. The Dreamcast is something Mr. FG bought back in the day. 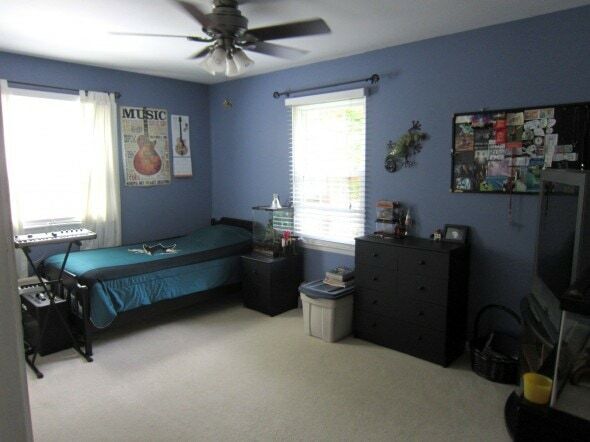 His room looks fantastic! Do you peek in there all the time to admire it? I would. Regarding the Bionicle collection, is this something you’d only sell locally? No, we’d definitely consider selling it to you if you want to pay shipping! Nice frugal transformation! My room was always bright pink growing up. 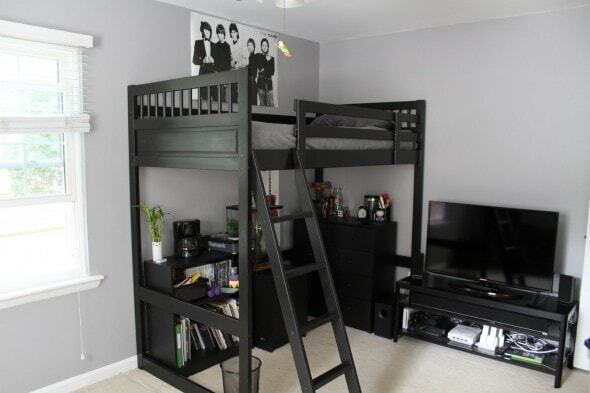 I could’ve totally gone for the cool grey color palate in my teenage years. This looks GREAT! Perfect for a teen boy! I have to say I’m surprised you allow a TV in his bedroom. Is that your only television?? Hope he enjoys his new room! It should serve him well for years to come! Great job! No, we also have one downstairs in our office, but we do not have one in the living room. 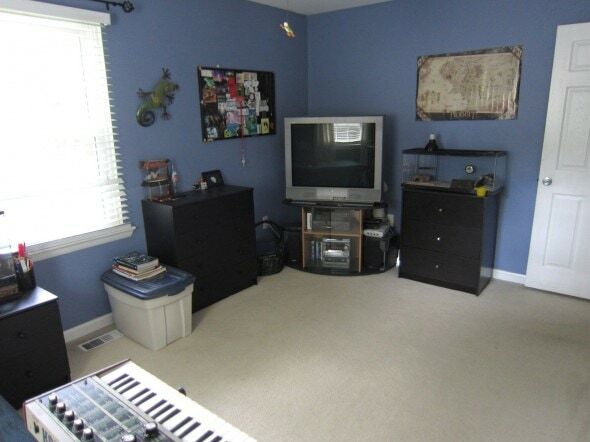 The TV in his room is only used for allotted daily screen time for the kids, so we’re fine with having it in there. We could possibly make it with just the TV in the office, but the problem is that there is NO room in the office for gaming consoles. So unless we want to get rid of all the gaming consoles, a TV in Joshua’s room is the way to go. OTOH next summer is a long way away. How much help could the girls provide, to make the task less onerous? I know, right? In the last few years, he’s suddenly become quite the minimalist. The room update looks amazing! It is kind of hard! I had a bunk bed growing up, and so I’ve had lots of practice. To make it look neat, you have to kind of pull on the covers from underneath the bed (ours all have slats, which means we can reach the underside pretty easily. It also helps if you don’t entirely undo the bed every night! 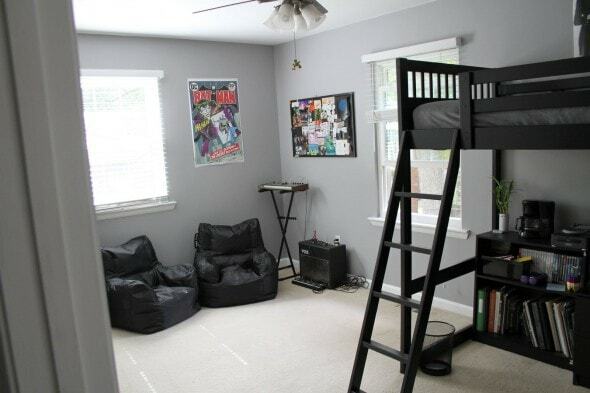 A perfect room for a young man! I’m not sure but it looks like his old TV may be the same one we had that we bought used from someone five years ago. It took two men to lift it, and I do mean MEN. I think our friends quietly snickered at it but we refused to give it up since it worked although it was quite hideous. And I was getting the same pictures on it as those folk with beautiful flat screens. About a month ago it gave up the ghost. Okay, part of me (the non frugal part) was secretly delighted. Our idea of technological research is to walk into Costco and speak to the clerk. We now own a small flat screen. His room looks great! 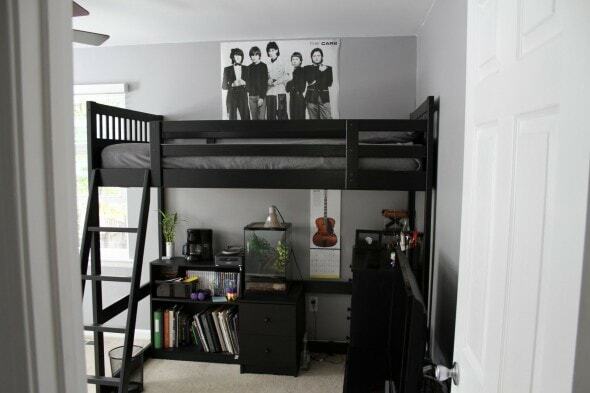 I love the loft bed. So, you’re either a relative or someone with a son who also has a drum set? Sharing the pain and all, lol?? Kristen, I love that you have managed to sound enthusiastic about the prospect of a DRUM SET in the house. Just typing the words makes me wince! The room looks wonderful. Well thought-out and should last for years, which is saying a lot, the way they grow and change in their teen years. Nice poster, too! My cousin was in a Cars video way back when…It’s “You Might Think”, which hasn’t aged all that well, but fortunately, she has. Well, Mr. FG and Joshua both play electric guitar already, and that is pretty darn loud sometimes. So, I think I’m fairly well prepped for a drum set. The room looks amazing! It’s funny how some of the photos look like they were shot in black and white. Great job, and what a wonderful fresh start for a great teenager! Oh, you’re right! 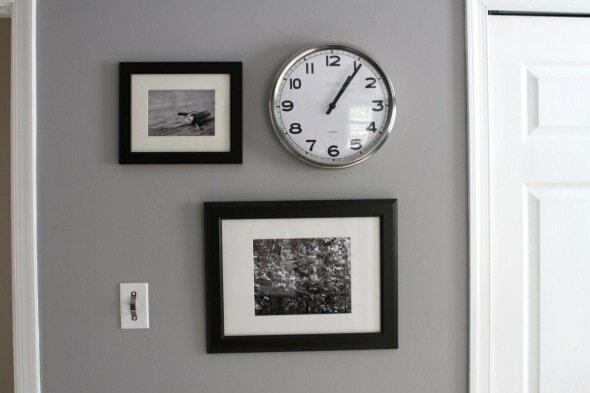 Especially the one of the clock wall. The little bamboo plant adds a little color on the other side of the room at least. very nice!!!!!!! Is that a San Jose Sharks bedspread? Yes, that’s his old comforter! 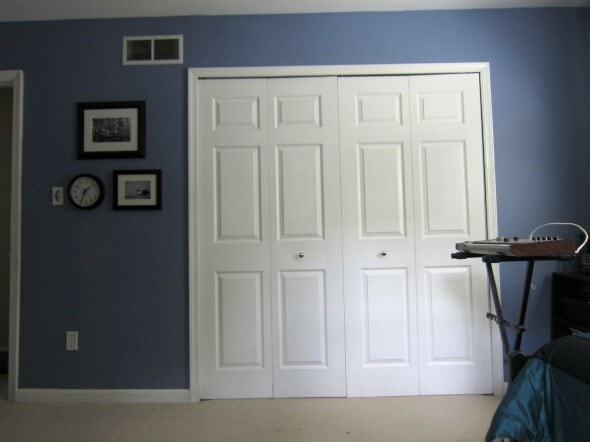 Wow, this room looks amazing! Our daughter’s room is in need of some personality. I guess our whole house is in need of some personality! One thing at a time though. This has nothing to do with his room; although, it does look very nice. I’m wondering about Joshua’s camera. Did you buy it for him? How did you come to choose the one you did? If you were to buy another one, would you choose the same one? Thanks! Well, oddly enough, I actually won his camera at Mr. FG’s holiday work party a few years ago! It’s an Canon Elph (just the $100 model) and it has worked out quite well for him. I think he’s about ready for an SLR soon, but this is a pretty decent point and shoot. Ooh, good eye! It’s a single-serve coffee-maker that my dad gave him, and I really don’t have any room for it in my kitchen. (Boo!) So he just stores it in his room, where he has ample space for it, and he brings it into the kitchen when he uses it.